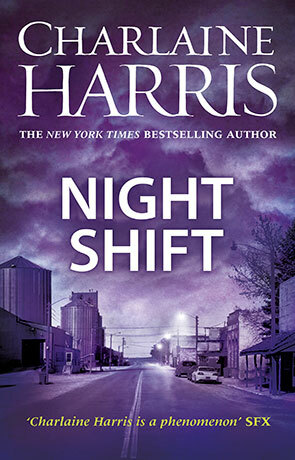 Night Shift continues the story of the rich and rewarding urban fantasy series Midnight Texas by Charlaine Harris. Harris writes fiction that is comforting, warm and relaxing with a feeling of the familiar. Her characters are people you want to meet and (mostly) befriend. Those who frequent the little sleepy town of Midnight are no exception. A cast who include a talking cat, a witch, a vampire and others who clearly aren't entirely (some even remotely) human. They are fascinating and Harris manages to keep them so by slowly building thier story bit by bit. The dynamics and interaction between the characters is superb and one of the real highlights of the book and the series. As with the two previous novels, Night Shift lifts some secrets about some of the Midnight folk, introduce a few new people and generally continue the lives of others. There is a bigger, bolder, building menace this time though and one that sets a greater sense of suspence than the previous books have. One of the things that really stands out about the series is how there isn't really one central protagonist, no-one person takes center stage — an interesting approach that only works due to Harris's ability to craft her characters. There is a little more of the vampire than there has been previously and few do vampire the way Harris does. The main story builds as the book progresses and when combined with the effortless reading style results in a book that is impossible to put down, it's one of those that once you start you simply can't stop reading. The ending, when it comes, is well played although feels a little brief after all the build-up. Non-the-less it's rewarding in its way and does leave you wanting more. Night Shift is an ideal urban fantasy tale, its got bags of style, wonderfully written characters and a great plot. Easy reading, rewarding, un-missable fiction. Written on 6th June 2016 by Ant.